I got my week started off on a good note by teaching TurboKick this morning at 5:30am. It's difficult to GET CRUNK at that ungodly hour, but after you get going, it's a paaarrrrtaaaay! B's Tip: ALWAYS work out on Monday. You are well-rested from the weekend and it sets the tone for the entire week. Powerful on Monday = Powerful on Tuesday, Wednesday, Thursday and Friday, too! How was your weekend? Do anything fun/exciting/special? On Saturday, we headed to Mackinaw Valley Vineyard for a free concert with some of Wes' co-workers. I didn't get a good picture of the venue but there were SOOOOO many people. Last year, we saw friends of our get married here. It's absolutely beautiful and their wine isn't bad either. My favorite is a red--"Alexander's Conquest." Mackinaw Valley Vineyard. 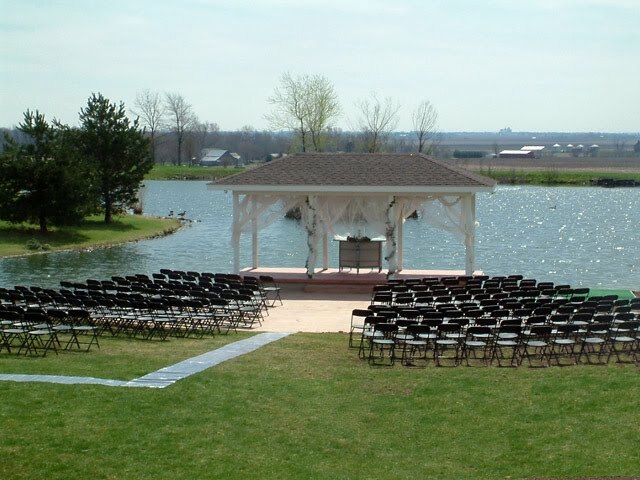 I didn't take this one (found in on a bridal venue website), but it gives you an idea how gorgeous this little Central Illinois oasis is. No cornfields!!! There was a wedding RIGHT BEFORE the concert. I mean, we saw the bride, groom and bridal party all boogying on the dance floor! You could bring your own food, but no beverages, which is genius b/c they're making serious $$$ on their vino. We brought along some cheeses, crackers, almonds and walnuts to share. The band was called Bubblegum Jack and they rocked the boat! They played lots of pop hits from the 80's, 90's and even a little country. This pic isn't clear, but I swear--the lead singer looked like a young Billy Ray Cyrus (think "Achy Breaky Heart" days). After the concert ended, we decided to take the party to the bar for what else??? KARAOKE! I'm tone-deaf, but we still had an awesome time. I can't remember why I was making that face. Umm...cut that crazy lady off! ...ALDI! One time I got made fun of for shopping here. "What are you poor?" they said. To which I replied, "Yes, A-hole, yes I am at the moment." In truth, I could be rich and still shop here! They have an AWESOME selection of affordable fruits, veggies, and dairy items. I found Vanilla Soy Milk for only $2.30! Sweeeeeet. I saw this at The Fresh Market and couldn't pass up the novelty of it--Pineapple Upside Down PIE?!?!? I've never heard of such...but it sure looked damn good! Total impulse purchase. Everything I needed to make dinner. And I still had to go to three stores to get it. I think pasta has healing properties--it heals heartbreak, depression, fatigue, and...hangovers :) But I didn't want just the standard spaghetti fare this eve--oh no--I needed something hearty and delicious. Like Cheese Tortellini Spinach Soup! Please excuse the crappy photo. I didn't want to use flash, and my apartment is like a medieval dungeon. I assure you it's yummy though. I served it with sun-dried tomato focaccia bread (in the background). This soup is SUPER simple and speedy. It only took 20 minutes to whip up. I used whole-wheat cheese tortellini and tossed in a little chopped onion with the stock and tomatoes for flavor. In a large pot, bring stock and tomatoes to simmer. Stir in tortellini and simmer gently for 3 minutes. Stir in spinach, garlic, basil, salt, pepper. Return to a simmer and cook for 2-3 more minutes. Serve hot with Parmesan cheese. Today I'm doing laundry and packing because I'M HEADED TO AUSTIN, TEXAS TOMORROW FOR A GIRL'S WEEKEND with my mom, sister and BFF!!! Does the three exclamation marks tell you tell how excited I am? :) I haven't seen my sister since December and I haven't seen my BFF in almost a YEAR! No worries, I have lots of posts in store, so keep on comin' back! LOOK OUT AUSTIN--here comes B! If you could drop everything and go on vacation RIGHT NOW (cost not being a factor). Where would you go? Have you and your friends been on a "retreat" before? Where did ya go? Are you a True Blood Fan? What's your go-to hangover cure? I love tortellini soup. I've made it in the past and loved it but the kids won't eat it. What else is new? I love love love True Blood. Last night's episode was so good. What is Sookie???? Entourage, on the other hand is really turning out to be a disappointment this season. hi - if we could go anywhere right now - it would be europe again. I love it there. my family has a house in spain - but the flights are so damn expensive. and i really want to go to london. First off I wanna say I am jealous of your trip to Austin. Be sure to look up my Austin post from last month. I put some great places to eat and party at. :) Have fun because I have never done the girlfriend retreat thing before. If I could go anywhere it would be someplace in Europe again with my hubby. Also yes I am super huge True Blood fan!! As for the hangover cure...drink tons of water and eat protein! I'm a Truebie for life! Also, The Fresh Market is pretty cool. My husband went there recently and loved it. I have yet to go.